September 22, 2017 / Filed under Blog, Director's Blog, Safety. You read about them in the paper just about every day: an elderly man killed crossing 34th Street S in St. Petersburg, hit by a driver at 1:42 AM. Or maybe it’s a young woman, attempting to cross US 19 near Sunset Point Road; stepping in front of a truck driver is all the information we know. Maybe it’s a bicyclist, riding in the bike lane on Ulmerton Road at just before 5 o’clock in the morning, with lights on and wearing a reflective yellow vest, dead from a driver running him over from behind. You might remember the school crossing guard killed at SR 60 and Belcher Road in Clearwater by a distracted driver. Bicyclists try to cross the street at Main Street and County Road 1 in Dunedin. We read the news accounts or hear about them during drive time traffic reports discussing what’s causing a delay on Kennedy Boulevard: a car vs. pedestrian crash. We report the statistics: As of today, there have been 88 fatalities thus far in 2017. The county’s crash data system showed 109 fatalities in 2016, and 520 fatalities resulting from 498 crashes in the last five years across Pinellas County. Even more die in Hillsborough County and throughout states like Florida, where wide highways invoke a sense of speed and efficiency in every driver. We’re all numb. The news stories and crash data come across in a steady stream. Our eyes may skim over the headline, and we tune out the report on the radio. The body count becomes just another statistic. They are your neighbors and mine, coworkers, brothers, sisters, aunts and uncles, grandparents. We are killing people from all walks of life, age and income. The American carnage on our roadways only really hits home when you see a crash in person or when it affects someone you know or love. Following a City Council meeting in Dunedin on Thursday after talking about safety and our Vision Zero goal of no fatalities and reduced serious injuries for our county, I experienced that awful feeling once again. Traveling east on State Road 580 toward US 19, I slowed and pulled to the side as an ambulance coming from behind passed with siren and flashing lights. Just ahead the ambulance stopped in the middle lane at a signalized intersection amid several stopped cars, and wheeled out a stretcher. As I slowly passed through the green light with my windows down, I looked left and saw a young woman in a shirt and jeans lying in the crosswalk. She was sobbing and wailing loudly, apparently injured and certainly frightened. She sounded like my daughter crying after learning of a death of an older family member or beloved pet, but much worse. An anguished couple stood looking outside their stopped cars in the far right lane. I could not tell if they were involved or witnesses. It was not clear what happened, but the crash bothered me. 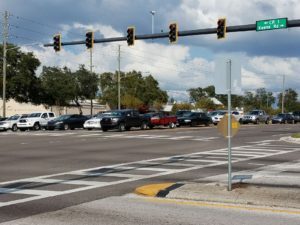 It was dusk and 580 – known without irony as Main Street in Dunedin – is a straight six-lane highway designed to move cars as efficiently as possible across North Pinellas and Hillsborough Counties between beachside and countryside communities. I wondered if the young woman was hit while walking in the crosswalk, or did she somehow exit the car and fall to the ground after her vehicle crashed? She may recover, but this will be one more statistic, one more notation in a database, and we’ll just keep moving on because we can’t tolerate 15-20 seconds more of delay getting from Point A to Point B. Main Street and County Road 1 in Dunedin. What bothered me more than the crash itself was the behavior of the cars around me after I resumed driving beyond the crash site. While I numbly drove on, keenly aware of my surroundings, on both 580 eastbound and then McMullen Booth Road heading south, aggressive drivers whipped past me on the left and the right as I drove slightly above the speed limit at 50 miles an hour. Just for context, a pedestrian only has a one in 10 chance of survival in a crash with a vehicle traveling at 40 miles per hour. At 30 mph, it’s five out of 10. As the cars passed me, none of them bothered to signal as they changed lanes and merged in front of me to avoid slower moving cars. Well past the peak period of traffic activity at 7 p.m., both those roads can turn into a scene from the Fast and the Furious movies. With the roadways we’ve designed and our sprawling development patterns, every hour is rush hour in Pinellas County. This can’t continue. 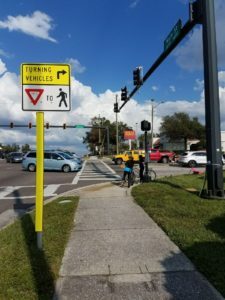 Pinellas has double the fatal crash rate for bicyclists and pedestrians as the nation overall, and leads the most populated counties in Florida in killing people on bikes or foot. We believe we’re supporting economic development by making roads faster and wider, but we’re slowly killing the businesses that depend on our roads for visibility and access, and we’re harming neighborhood quality of life and home values by placing too many residences within earshot, eyesight and physical conflict with high speed roads that lack safe and inviting places to cross or travel along safely on foot, bicycle or even in a car. This has to change. It’s well past time that we adapt to our changing environment, build our communities in a way that brings lasting value to people and places, and connect our neighborhoods with a strong sense of identity and character – things that we largely abandoned in the 1950s and ‘60s as the growth-without-concern mentality took hold across our land. We are using our planning and project development funds to change the way people drive on our roadways by conducting Roadway Safety Audits, adding bicycle and pedestrian facilities and remaking our streets to be more accommodating for all users regardless of their age or ability. I’m sick of the carnage. How about you? The culture of speed is what needs addressing. The culture of people needs modification in terms of the utility called the roadway. It moves people by foot or vehicle and those vulnerable users need status and statues that reflect guaranteed safe travel. It’s a new vision that’s been needed for transportation culture. Car culture is corrupt and stale. I would like to see more enforcement for aggressive driving and much more education! This is a sad incident, multiplied many times around the area unfortunately. However, getting anywhere around Pinellas is difficult at the best of times. And worse when the annual arrival of snowbirds and spring breakers arrive. There are simply too many people squashed into a very small county. Commuters have to get to work on time, kids have to get to school, etc. I don’t know what the solution is. Moving away maybe?